The eagle is used in heraldry as a charge, as a supporter, and as a crest. The symbolism of the heraldic eagle is connected with the Roman Empire on one hand (especially in the case of the double-headed eagle), and with Saint John the Evangelist on the other. Carolingian ivory plaque with the Eagle of Saint John with halo, Victoria & Albert Museum. The iconography of the heraldic eagle, as with other heraldic beasts, is inherited from early medieval tradition. It rests on a dual symbolism: On one hand it was seen as a symbol of the Roman Empire (the Roman Eagle had been introduced as the standardised emblem of the Roman legions under consul Gaius Marius in 102 BC); on the other hand, the eagle in early medieval iconography represented Saint John the Evangelist, ultimately based on the tradition of the four living creatures in Ezekiel. In early heraldry or proto-heraldry of the 12th century, however, the eagle as a heraldic charge was not necessarily tied to either imperial or biblical symbolism. The Anglo-Norman L'Aigle family, who held Pevensey castle and the Borough of Pevensey used the eagle as an emblem in an instance of canting arms. The earliest known use of the eagle as a heraldic charge is found in the Great Seal of Leopold IV of Austria, dated 1136. Adalbert I, Duke of Teck used an eagle in his seal in c. 1190. By the late medieval period, in German heraldry, the eagle developed into a symbol of the empire, and thus became comparatively rare outside of coats of arms derived from the imperial emblem. The first evidence of the use of the double-headed Reichsadler (imperial eagle) dates to the mid-13th century (Chronica Majora, c. 1250; Segar's Roll, c. 1280). The German kings still use the single-headed eagle throughout the 14th century. In Italy, the Ghibelline faction (the faction loyal to the emperor in the drawn-out conflict between emperors and popes) began to display or an eagle sable in chief of their coats of arms, known as capo dell'impero or "chief of the empire". Similarly, German cities began to incorporate the imperial eagle into their seals and coats of arms to imply imperial immediacy. From such usage, use of the heraldic eagle by the end of the medieval period became so strongly associated with the empire that the eagle was rarely used as an independent heraldic charge. Examples of continued use of eagle coats of arms based on traditions of the 13th century include the Polish, Moravian and Silesian coats of arms. By far the oldest and most common manner of depicting the eagle in heraldry is what would come to be known as displayed (éployée), in direct imitation of Roman iconography. The eagle's body is depicted with lateral symmetry, but its head is facing the dexter side. In late medieval blasons, the term "eagle" (Middle French egle) without specification refers to an "eagle displayed". In early modern English terminology, it became common to use "eagle displayed". Also specific to English heraldry is the distinction between "eagle displayed with its wings elevated" and "eagle displayed with wings inverted". This is due to a regional English convention of depicting the tips of the wings pointing upward, while in continental heraldry, the tips of the wings were depicted downward ("inverted"). Later, English heraldry partially adopted the continental convention, leading to a situation where it was unclear whether the two forms should be considered equivalent. In German heraldry, no attitude other than "eagle displayed with wings inverted" ever became current, so that the simple blason of "eagle" (Adler) still refers to this configuration. The depiction of the heraldic eagle is subject to a great range of variation in style. The eagle was far more common in continental European—particularly German—than English heraldry, and it most frequently appears Sable (colored black) with its beak and claws Or (colored gold or yellow). It is often depicted membered (having limbs of a different color than the body) / armed (an animal depicted with its natural weapons of a different color than the body) and langued (depicted having a tongue of a different color than the body) gules (colored red), that is, with red claws / talons and tongue. In its relatively few instances in Gallo-British heraldry, the outermost feathers are typically longer and point upward. An eagle can appear either single- or double-headed (bicapitate), in rare cases triple-headed (tricapitate) eagle is seen. Recursant describes an eagle with his head turned to the sinister (left side of the field). In full aspect describes an eagle with his head facing the onlooker. In trian aspect (a rare, later 16th and 17th century heraldry term) describes when the eagle's head is facing at a three-quarter view to give the appearance of depth – with the head cocked at an angle somewhere between profile and straight-on. 1. Eagle close. 2. Eagle rising, wings elevated and addorsed. 3. Eagle rising, wings elevated and displayed. 4. Eagle rising, wings addorsed and inverted. 5. Eagle rising, wings displayed and inverted. Addorsed ("back to back") is when the eagle is shown statant (standing in profile and facing the right side of the field) and ready to fly, with the wings shown open behind the eagle so that they almost touch. Espanie or épandre ("expanded") is when the eagle is shown affronté (facing the viewer with the head turned to the dexter) and the wings are shown with the tips upward. Abaisé or abaissé ("lowered") is when the eagle is shown affronté (facing the viewer) and the wings are shown with the tips downward. A good example is the eagle on the reverse side of the US quarter dollar coin. Klee-Stengeln ("clover-stems") are the pair of long-stemmed trefoil-type charges on the wings of 13th-century German depictions of the heraldic eagle. They represent the upper edge of the wings and are normally Or (yellow), like the beak and claws. Reinmar von Zweter fashioned the Klee-Stengeln of his eagle into a second and third head. The informal term "spread eagle" is derived from a heraldic depiction of an eagle displayed (i.e. upright with both wings, both legs, and tailfeathers all outstretched). The wings are usually depicted "expanded" or "elevated" (i.e., with the points upward); displayed inverted is when the wings are depicted points downward. According to Hugh Clark, An Introduction to Heraldry, the term spread eagle refers to "an eagle with two heads, displayed", but this distinction has apparently been lost in modern usage. Most of the eagles used as emblems of various monarchs and states are displayed, including those on the coats of arms of Germany, Poland, Romania, and the United States. Displayed is the most common attitude, with examples going back to the early Middle Ages. An eagle rising or rousant (essorant) is preparing to fly, but its feet are still on the ground. It is the eagle's version of statant (standing in profile and facing the right side of the field). with wings addorsed and elevated means in profile with the wings swept to the back and their tips extended upwards. with wings addorsed and inverted means in profile with wings swept to the back and their tips extended downwards. with wings displayed and elevated means facing to the front with the wings spread and their tips extended upwards. with wings displayed and inverted means facing to the front with the wings spread and their tips extended downwards. There is sometimes confusion between a rousant eagle with displayed wings and a displayed eagle. The difference is that rousant eagles face to the right and have their feet on the ground and displayed eagles face the viewer, have their legs splayed out, and the tail is completely visible. There is a debate over whether rousant or displayed is the eagle's default depiction. Volant describes an eagle in profile shown in flight with wings shown addorsed and elevated and its legs together and tucked under. It is considered in bend ("diagonal") as it is flying from the lower sinister (heraldic left, from the shield-holder's point of view) to the upper dexter (heraldic right, from the shield-holder's point of view) of the field. However, the term "in bend" is not used unless a bend is actually on the field. Like the heraldic lion, the heraldic eagle is seen as dominating the field and normally cannot brook a rival. When two eagles are depicted on a field, they are usually shown combatant, that is, facing each other with wings spread and one claw extended, as though they were fighting. Respectant, the term used for depicting domestic or game animals shown facing each other, is not used because eagles are aggressive predators. When two eagles are shown back-to-back and facing the edges of the field the term used is addorsed / endorsed or adossés ("back-to-back"). 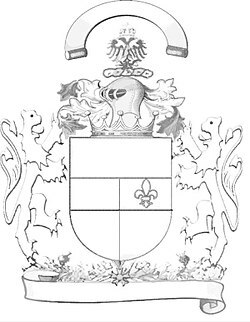 Eagle decapitate (without head), coat of arms of German nobility von der Hoven, alias: "Pampus". This term is used when three or more Eagles are shown on a field. They represent immature Eagles. Originally the term Erne or Alerion in early Heraldry referred to a regular Eagle. Later heralds used the term Alerion to depict baby Eagles. To differentiate them from mature Eagles, Alerions were shown as an Eagle Displayed Inverted without a beak or claws (disarmed). To difference it from a decapitate (headless) eagle, the Alerion has a bulb-shaped head with an eye staring towards the Dexter (right-hand side) of the field. This was later simplified in modern heraldry as an abstract winged oval. An example is the arms of the Duchy of Lorraine (Or, on a Bend Gules, 3 Alerions Abaisé Argent). It supposedly had been inspired by the assumed arms of crusader Geoffrey de Bouillon, who supposedly killed three white eaglets with a bow and arrow when out hunting. It is far more likely to be Canting arms that are a pun based on Lorraine / Erne. "Imperial Eagle" redirects here. For other uses, see Imperial Eagle (disambiguation). The Aquila was the eagle standard of a Roman legion, carried by a special grade legionary known as an Aquilifer, from the second consulship of Gaius Marius (104 BC) used as the only legionary standard. It was made of silver, or bronze, with outstretched wings. The eagle was not immediately retained as a symbol of the Roman Empire in general in the early medieval period. Neither the early Byzantine emperors nor the Carolingians used the eagle in their coins or seals. It appears that the eagle is only revived as a symbol of Roman imperial power in the high medieval period, being featured on the sceptres of the Ottonians in the late 10th century, and the double-headed eagle gradually appearing association with the Komnenos dynasty in the 11th and 12th centuries. The eagle is used as an emblem by the Holy Roman Emperors from at least the time of Otto III (late 10th century), in the form of the "eagle-sceptre". Frederick Barbarossa (r. 1155–90) is reported as having displayed an eagle on his banner, Otto IV (r. 1209–15) an eagle hovering over a dragon. The first evidence of the use of the Reichsadler (imperial eagle) proper dates to the mid-13th century. Matthew Paris' Chronica Majora (c. 1250) displays a coat of arms with a black double-headed eagle in a yellow field for Otto IV. Segar's Roll (c. 1280) displays the same coat of arms, or, an eagle sable beaked and armed gules for the "king of Germany" (rey de almayne). 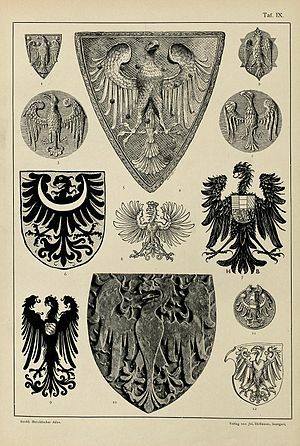 Outside of these exceptional depictions (in sources from outside of Germany), the double-headed eagle remains unattested as emblem of the German kings or emperors until the 1430s. In the 14th century, the German kings use the royal banner (Königsfahne) with the single-headed eagle. The earliest pictorial representations of this date to the first half of the 14th century (Codex Balduini). This banner develops into the Reichssturmfahne (imperial war flag) with the double-headed Reichsadler (imperial eagle) by the mid-15th century. Sigismund (r. 1433–37) still uses either the single-headed or the double-headed eagle. Consistent use of the double-headed eagle only begins with the Habsburg emperors (with Frederick III, 1440). After 1558 (Ferdinand I), the title of King of the Romans is used for the emperor's heir apparent; the double-headed eagle now represents the emperor, and the single-headed eagle the emperor's heir apparent (thus, Ferdinand IV, King of the Romans, who pre-deceased his father in 1654 and never became emperor, is given a single-headed eagle only). Use of the double-headed eagle is first attested in Byzantine art of the 10th century. Its use as an imperial emblem, however, is considerably younger, attested with certainty only in the 15th century, i.e. 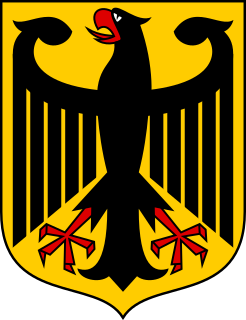 at about the same time the double-headed eagle was also adopted in the Holy Roman Empire. 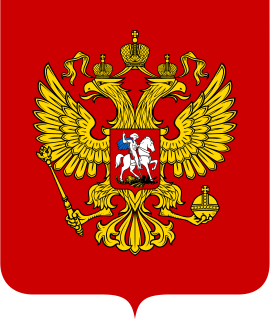 There are speculative theories according to which the double-headed eagle was first introduced as a dynastic emblem of the Komnenoi, from as early as the 11th century. The Palaiologoi emperors appear to have used the double-headed eagle often as ornamental emblem on their robes etc. during the 13th and 14th century, but only in the 15th century as an emblem on coins or seals. In the 15th century, the double-heade eagle was first used as an emblem by the semi-autonomous Despots of the Morea, who were younger imperial princes, and by the Gattilusi of Lesbos, who were Palaiologan relatives and vassals. The double-headed eagle was used in the breakaway Empire of Trebizond as well. Western portolans of the 14th–15th centuries use the double-headed eagle (silver/golden on red/vermilion) as the symbol of Trebizond rather than Constantinople. Single-headed eagles are also attested in Trapezuntine coins, and a 1421 source depicts the Trapezuntine flag as yellow with a red single-headed eagle. Apparently, just as in the metropolitan Byzantine state, the use of both motifs, single and double-headed, continued side by side. Other Balkan states followed the Byzantine model as well: chiefly the Serbians, but also the Bulgarians and Albania under George Kastrioti (better known as Skanderbeg), while after 1472 the eagle was adopted by Muscovy, when Ivan III of Russia married Sophia, daughter of Thomas Palaiologos. The Serbian eagle (in the modern coat of arms of Serbia, 1882) is derived from the coat of arms of the Nemanjić dynasty (16th century), in turn derived from the Byzantine imperial eagle. Use of the double-headed eagle for Serbia is among the examples of early representations in Western portolans (Angelino Dulcert 1339). John the Evangelist, the author of the fourth gospel account, is symbolized by an eagle, often with a halo, an animal may have originally been seen as the king of the birds. The eagle is a figure of the sky, and believed by Christian scholars to be able to look straight into the sun. The better known heraldic use of the Eagle of St. John has been the single supporter chose by Queen Isabella of Castile in her armorial achievement used as heiress and later integrated into the heraldry of the Catholic Monarchs. This election alludes to the queen's great devotion to the evangelist that predated her accession to the throne. There is a magnificent tapestry with the armorial achievement of the Catholic Monarchs in the Throne Room of the Alcazar of Segovia. The Eagle of St. John was placed on side of the shields used as English consort by Catherine of Aragon, daughter of the Catholic Monarchs, Mary I and King Philip as English monarchs. In Spain, Philip bore the Eagle of St John (single or two figures depending versions) in his ornamented armorial achievements until 1668. The Eagle of the Evangelist was recovered as single supporter holding the 1939, 1945 and 1977 official models of the armorial achievement of Spain and it has been removed in 1981 when the current was adopted. The use of the eagle of St. John was exploited by the Spanish dictator Francisco Franco, who used it as a symbol of his regime. The Eagle of St. John's is also frequently used in modern civic heraldry. The eagles in the Polish, Moravian and Silesian coats of arms are based on 13th-century dynastic arms. The Piast dynasty used a coat of arms with an eagle in the 13th century, which gave rise to the Polish coat of arms directly. The Silesian Piasts in the 14th century used an eagle modified by a crescent, which became the coat of arms of the Duchy of Silesia. The Margraviate of Moravia from at least the 1270s used a chequered eagle. The Moravian Eagle (without chequering) was first documented on the seal of Ottokar's uncle, Margrave Přemysl (d. 1239) and is thus likely derived from the coat of arms of the Přemyslid dynasty, who in the early 13th century used a "flaming eagle" coat of arms alongside the Bohemian lion for the Kingdom of Bohemia. Coat of arms of the King of Poland, after the Grand Armorial équestre de la Toison d'or (c. 1430–1461). Germany: the German Bundesadler (since 1950), a direct continuation of the Reichsadler design used in the Weimar Republic from 1928. Liechtenstein: Coat of arms of Hans-Adam II, Prince of Liechtenstein (b. 1945), with the Silesian eagle in the first quarter. Moldova: an eagle displayed holding an Orthodox cross in its beak, adopted 1990. Montenegro: Byzantine imperial eagle (2004). Poland: Piast dynasty, adopted 1990. Russia: Byzantine imperial eagle, adopted 1992, first adopted for Muscovy by Ivan III of Russia (1472). Serbia: Serbian eagle (Byzantine imperial eagle, Nemanjić dynasty). 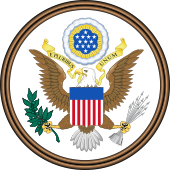 Since 20 June 1782, the United States has used its national bird, the bald eagle, on its Great Seal; the choice was intended to at once recall the Roman Republic and be uniquely American (the bald eagle being indigenous to North America). The representation of the American Eagle is thus a unique combination between a naturalistic depiction of the bird, and the traditional heraldic attitude of the "eagle displayed". The American Eagle has been a popular emblem throughout the life of the republic, with an eagle appearing in its current form since 1885, in the flags and seals of the President, Navy, Marine Corps, Air Force, Justice Department, Defense Department, Postal Service, and other organizations, on various coins (such as the quarter dollar), and in various American corporate logos past and present, such as those of Case and American Eagle Outfitters. The French Imperial Eagle or Aigle de drapeau (lit. "flag eagle") was a figure of an eagle on a staff carried into battle as a standard by the Grande Armée of Napoleon I during the Napoleonic Wars. Although they were presented with Regimental Colours, the regiments of Napoleon I tended to carry at their head the Imperial Eagle. This was the bronze sculpture of an eagle weighing 1.85 kg (4 lb), mounted on top of the blue regimental flagpole. They were made from six separately cast pieces and, when assembled, measured 310 mm (12 in) in height and 255 mm (10 in) in width. On the base would be the regiment's number or, in the case of the Guard, Garde Impériale. The eagle bore the same significance to French Imperial regiments as the colours did to British regiments - to lose the eagle would bring shame to the regiment, who had pledged to defend it to the death. Upon Napoleon's fall, the restored monarchy of Louis XVIII of France ordered all eagles to be destroyed and only a very small number escaped. When the former emperor returned to power in 1815 (known as the Hundred Days) he immediately had more eagles produced, although the quality did not match the originals. The workmanship was of a lesser quality and the main distinguishing changes had the new models with closed beaks and they were set in a more crouched posture. Napoleon also used the French Imperial Eagle in the heraldry of the First Empire, as did his nephew Napoleon III during the Second Empire. An eagle remains in the arms of the House of Bonaparte and the current royal house of Sweden retains the French Imperial Eagle on its dynastic inescutcheon, as his founder, Jean Bernadotte, was a Marshal of France. The coat of arms of Panama (1904), has an eagle rising with wings displayed and elevated on place of a crest. Since 2002 the eagle is officially specified as a harpy eagle. The coat of arms of Jordan (1921) featured an eagle before the development of the "Eagle of Saladin" emblem. The coat of arms of Iceland (1944) has an eagle or griffin (Gammur) among its supporters. The coat of arms of the Philippines (1946) includes the bald eagle of the United States. The coat of arms of Ghana (1957) has two tawny eagles as supporters. The coat of arms of Mexico (1968) shows a Mexican golden eagle devouring a rattle snake. The coat of arms of Namibia (1990) has an African fish eagle. The flag of Kazakhstan has a soaring steppe eagle. The coat of arms of Armenia (1992) has an eagle and a lion for the Artaxiad dynasty. The coat of arms of South Sudan (2011) has an African fish eagle. The emblem of Kyrgyzstan (2016) has a hawk. Naturalistic eagles are often used in military emblems, such as the emblem of the Royal Air Force (United Kingdom), NATO School, the European Personnel Recovery Centre, etc. In Arab nationalism, with the Egyptian Revolution of 1952, the eagle became the symbol of revolutionary Egypt, and was subsequently adopted by several other Arab states (the United Arab Emirates, Iraq, Libya, the partially recognised State of Palestine, and Yemen). The eagle is commonly identified as Saladin's emblem due to his yellow flag was adorned with an eagle, as well as the depiction of an Egyptian vulture on the west wall of the Cairo Citadel which was built during the rule of Saladin. :24 The current design of the eagle itself, however, is of more recent date specifically after the Egyptian revolution of 1952. As a heraldic symbol identified with Arab nationalism, the Eagle of Saladin was subsequently adopted as the coats of arms of Iraq and Palestine. It has previously been the coat of arms of Libya, but later replaced by the Hawk of Quraish. The Hawk of Quraish was itself abandoned after the Libyan Civil War. The Eagle of Saladin was part of the coat of arms of South Yemen prior to that country's unification with North Yemen. The stone-carved Zimbabwe Bird is the national emblem of Zimbabwe, appearing on the national flags and coats of arms of both Zimbabwe and Rhodesia (since 1924), as well as on banknotes and coins (first on Rhodesian pound and then Rhodesian dollar). It probably represents the bateleur eagle or the African fish eagle. The bird's design is derived from a number of soapstone sculptures found in the ruins of the ancient city of Great Zimbabwe. ^ Depiction of this coat of arms for Wernher von Homberg as participant in the Italian campaign of Henry VII in Codex Balduini due to the similarity with the imperial coat of arms had long been misinterpreted as representing Henry himself. Georg Irmer, Die Romfahrt Kaiser Heinrich's VII im Bildercyclus des Codex Balduini Trevirensis (1881), p. 45. ^ Die Wappen der Deutschen Landesfürsten (= J. Siebmachers großes Wappenbuch) vol. 1 part 2-5 (reprint), Nuremberg (1909-1929). ^ "it will be to English eyes, accustomed to our conventional spread-eagle, doubtless rather startling to observe that the German type of the eagle, which follows the Roman disposition of the wings (which so many of our heraldic artists at the present day appear inclined to adopt either in the accepted German or in a slightly modified form as an eagle displayed) is certainly not a true displayed eagle according to our English ideas and requirements, inasmuch as the wings are inverted. It should be observed that in German heraldry it is simply termed an eagle, and not an eagle displayed. Considering, however, its very close resemblance to our eagle displayed, and also its very artistic appearance, there is every excuse for its employment in this country, and I for one should be sorry to observe its slowly increasing favour checked in this country. It is quite possible, however, to transfer the salient and striking points of beauty to the more orthodox position of the wings. The eagle (compared with the lion and the ordinaries) had no such predominance in early British heraldry that it enjoyed in Continental armory, and therefore it may be better to trace the artistic development of the German eagle. [...] no one form can be said to be more correct than any other, either from the point of view of nature or from the point of view of ancient precedent. This state of affairs is eminently unsatisfactory, because in these days of necessary differentiation no heraldic artist of any appreciable knowledge or ability has claimed the liberty (which certainly has not been officially conceded) to depict an eagle rising with wings elevated and displayed, when it has been granted with the wings in the position addorsed and inverted. Such a liberty when the wings happen to be charged, as they so frequently are in modern English crests, must clearly be an impossibility." Arthur Charles Fox-Davies , A Complete Guide to Heraldry (1909), p. 233, 235. ^ Arthur Charles Fox-Davies, A Complete Guide to Heraldry (1909), p. 234. ^  granted in 1957 to Waiblingen (kreis) The three heads symbolise the three former territories that were transformed into the district. ^ Reinmar von Zweter's peculiar eagle is famously depicted in the Codex Manesse. ^ Meyers Konversations-Lexikon (1897), s.v. "Banner". ^ Zapheiriou, N. (1947). Η ελληνική σημαία από την αρχαιότητα ως σήμερα ("The Greek Flag from Antiquity to present"). Athens, Greece. pp. 21–22. . "Ο φωτισμένος αυτός Αυτοκράτορας καταγόταν από Οίκο της Παφλαγονίας, όπου στην πόλη Γάγγρα υπήρχε ο θρύλος της ύπαρξης φτερωτού αετόμορφου και δικέφαλου θηρίου (γνωστού ως Χάγκα), το οποίο και κοσμούσε το θυρεό του κτήματος της οικογένειάς του στην Καστάμονη." It is unclear where Zapheiriou's term Haga (Χάγκα) is taken from; it does not appear to find further reflection in scholarly literature but it was adopted by historical fiction author Gordon Doherty in his Strategos: Island in the Storm (2014), see note on p. 390: "One theory is that the symbol was adopted from the many ancient Hittite rock carvings of the mythical Haga found throughout Anatolia." ^ Eleni Kokkonis-Lambropoulos & Katerina Korres-Zografos (1997). Greek flags, arms and insignia (Ελληνικές Σημαίες, Σήματα-Εμβλήματα) (in Greek). E. Kokkonis-G. Tsiveriotis. p. 52. ISBN 960-7795-01-6. ^ VV. AA., Isabel la Católica en la Real Academia de la Historia, Real Academia de la Historia, 2004. ISBN 978-84-95983-54-1. Cfr. para la heráldica de Isabel y Fernando las pp. 72 & ff. ^ Image of the Thron Room of the Alcázar of Segovia. ^ Francisco Olmos, José María de. Las primeras acuñaciones del príncipe Felipe de España (1554-1556): Soberano de Milán Nápoles e Inglaterra, pp. 158-162. ^ Menéndez Pidal y Navascués, Faustino; O'Donnell y Duque de Estrada, Hugo; Lolo, Begoña (1999). Símbolos de España [The Symbols of Spain]. Madrid: Centro de Estudios Políticos y Constitucionales. p. 255. ISBN 84-259-1074-9. ^ Act 33/1981, 5 October (BOE No 250, 19 October 1981). Coat of arms of Spain (in Spanish). ^ Růžek, Vladimír (2013). "Cesty k definici (nejen) moravského znaku a praporu". Veřejná správa, No. 10 (in Czech). pp. 20–22:22. ISSN 1213-6581. ^ Hathaway 2003, p. 96-7. ^ Rabbat, N.O. (1995). The Citadel of Cairo: A New Interpretation of Royal Mameluk Architecture. Leiden: Brill. ^ Thomas N. Huffman (1985). "The Soapstone Birds from Great Zimbabwe". African Arts. 18 (3): 68–73, 99–100. JSTOR 3336358. ^ Paul Sinclair (2001). "Review: The Soapstone Birds of Great Zimbabwe Symbols of a Nation by Edward Matenga". The South African Archaeological Bulletin. 56 (173/174): 105–106. JSTOR 3889033. Wikimedia Commons has media related to Eagles in heraldry. The coat of arms of Serbia is a re-introduction of the coat of arms of the Kingdom of Serbia (1882–1918) adopted by the Republic of Serbia in 2004 and later slightly redesigned in 2010. The coat of arms consists of two main heraldic symbols which represent the national identity of the Serbian people across the centuries, the Serbian eagle and the Serbian cross. The coat of arms of Germany displays a black eagle with a red beak, a red tongue and red feet on a golden field, which is blazoned: Or, an eagle displayed sable beaked langued and membered gules. This is the Bundesadler, formerly known as the Reichsadler. The Serbian cross is a national symbol of Serbia, part of the coat of arms and flag of Serbia, and of the Serbian Orthodox Church. It is based on the tetragrammic cross emblem/flag of the Byzantine Palaiologos dynasty, with the difference that in Serbian use the cross is usually white on a red background, rather than gold on a red background. In heraldry and vexillology, the double-headed eagle is a charge associated with the concept of Empire. Most modern uses of the symbol are directly or indirectly associated with its use by the Roman/Byzantine Empire, whose use of it represented the Empire's dominion over the Near East and the West. The symbol is much older, and its original meaning is debated among scholars. The eagle has long been a symbol of power and dominion. The coat of arms of Bucharest is the heraldic symbol of the capital city of Romania. The present-day coat of arms was adopted by Domnitor Alexandru Ioan Cuza, and changed under the Communist regime. In 1994, it was renewed again with minor alterations. Avalerion or alerion is a term for a heraldic bird. Historically, it referred to the regular heraldic eagle. Later heralds used the term alerion to refer to "baby eagles" or "eaglets". To differentiate them from mature Eagles, Alerions were shown as an Eagle Displayed Inverted without a beak or claws (disarmed). To difference it from a decapitate (headless) eagle, the Alerion has a bulb-shaped head with an eye staring towards the Dexter of the field. This was later simplified in modern heraldry as an abstract winged oval. The Reichsadler is the heraldic eagle, derived from the Roman eagle standard, used by the Holy Roman Emperors and in modern coats of arms of Germany, including those of the Second German Empire (1871–1918), the Weimar Republic (1919–1933) and the Third Reich. Over its long history, the Holy Roman Empire used many different heraldic forms, representing its numerous internal divisions. In heraldry, an attitude is the position in which an animal, bird, fish, human or human-like being is emblazoned as a charge, supporter or crest. Many attitudes apply only to predatory beasts and are exemplified by the beast most frequently found in heraldry—the lion. Some other terms apply only to docile animals, such as the doe. Other attitudes, such as volant, describe the positions of birds, mostly exemplified by the bird most frequently found in heraldry—the eagle. The term naiant (swimming), however, is usually reserved for fish but may also apply to swans, ducks or geese. Birds are often further described by the exact position of their wings. The term segreant is usually applied to the griffin, but this approximation of rampant which is more appropriate for them has also been applied to the dragon. The use of heraldry in Serbia or by Serbs is used by government bodies, subdivisions of the national government, organizations, corporations and by families. Serbian heraldry belongs culturally to the Byzantine tradition.